Use your browser's Reset Button to deselect all. With winter giving way to spring, many at MnDOT are shifting their focus to construction season. More than 220 projects were announced April 4 at the agency’s annual construction and maintenance kickoff events around the state. Outside of the state road construction program, crews will also work on 66 multimodal projects, including improvements to airports, ports, railroad systems and transit. “These are critical infrastructure projects that are going to help Minnesotans,” said Commissioner Margaret Anderson Kelliher. The commissioner also talked about the need for additional dedicated, sustainable transportation funding. Without additional revenue, Anderson Kelliher said state roads and bridges will continue to deteriorate, which could hurt the economy. Gov. Tim Walz is proposing a 20-cent gas tax increase as part of his budget, an increase he says will address the approximately $18 billion in transportation needs statewide. At the Central Office construction kickoff event, Metro District Construction Engineer Michael Beer described some of the more than 75 construction projects in the Twin Cities this summer. Some of the hot spots will include Interstate 35W from Burnsville to Rush City, I-494 near Inver Grove Heights and the I-94/I-694/I-494 interchange in Oakdale, Beer said. Navigation aids for travelers include 511mn.org, weekend traffic maps and the Know Your Route website. Visit mndot.gov/roadwork/current.html for a complete list of projects by highway. Project page information includes construction schedule, traffic impacts, maps, benefits and costs. 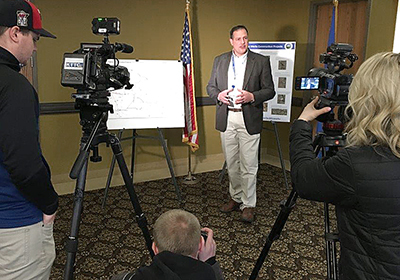 Visit mndot.gov/construction to see the April 4 news conference video, media briefing materials and lists of projects by districts. Right on the heels of the April 4 construction kickoff comes MnDOT’s observance of National Work Zone Awareness Week this week (April 8-12) to encourage safe driving through highway work zones. The week is an annual spring campaign to coincide with the start of road construction season and to bring attention to work zone safety. The theme for the week is “Drive Like You Work Here,” reminding motorists that when they are driving through work zones, construction and maintenance workers are working. More than 220 active work zones are scheduled throughout the state this season. A work zone is defined as any area where highway construction, maintenance or utility work is being done. Work zones are identified by warning signs, signals, barriers, pavement markings and flaggers. Work zones often include lane closures, traffic pattern shifts and reduced speeds. Each year in the U.S., a work zone crash occurs once every 5.4 minutes, according to the Federal Highway Administration. Every day, 70 work zone crashes occur that result in at least one injury. Every week, 12 work zone crashes occur that result in at least one fatality. Thirty-one people died and another 123 suffered serious injuries in work zones in the past three years in Minnesota. Sorenson said MnDOT works to alert motorists in work zones and sets speeds that are safe for navigating through them. He said when entering work zones, motorists should obey the posted speed limits, pay attention to signs and flaggers, be patient and focus on driving. 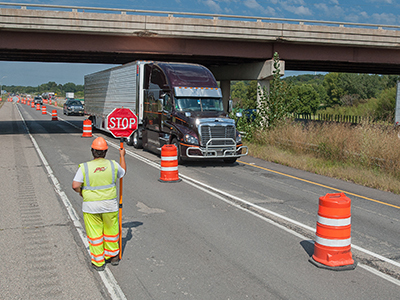 Learn more work zone safety tips. Fines for work zone violations start at $300. 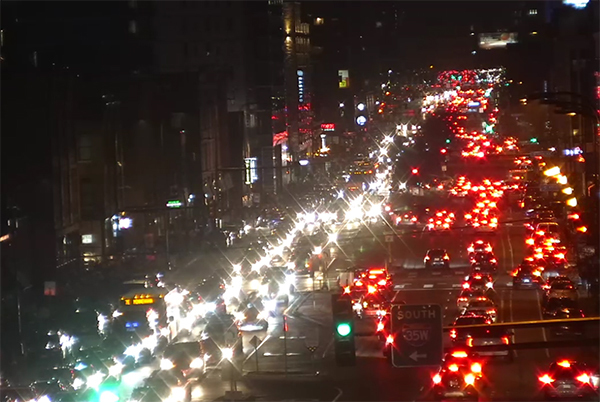 As fans converged on the Twin Cities for the Final Four NCAA basketball tournament, several months of MnDOT staff planning went into action to coordinate traffic and keep roadways clear for the 70,000-plus enthusiasts who attended the games. An additional 90,000 visitors were drawn to the Twin Cities for ancillary events surrounding the Final Four. Transportation planning included working with the Minnesota State Patrol to clear freeway incidents quickly. Metro Maintenance had staff on duty to respond within minutes to any major incidents like crashes and protests. The RTMC had additional staff in the center while supplementary FIRST trucks patrolled the freeways. In the days preceding the Final Four tournament, Metro Maintenance was out cleaning up freeways near downtown Minneapolis and the MSP airport. Maintenance staff and a contractor removed trash and worked diligently to repair guardrail hits over the weekend. “We removed more than 1,000 bags of trash before the Final Four,” said John Bieniek, acting Metro Maintenance engineer. During the event, Freeway Operations employees helped staff the Multi Agency Communications Center in Minneapolis, which included State Patrol, Minneapolis Police and Public Works, and federal agencies. The State Emergency Operations Center was on standby, to be opened if necessary. Metro Communications staff were available to coordinate with the Joint Information Center located in Minneapolis, as needed. Although the games came and went without any major incident, MnDOT and its partners at State Patrol and the city of Minneapolis were well prepared to ensure visitors to Minnesota had an enjoyable time. Sometimes, the best way to see things is from above. Aerial mapping is used to create a record of existing infrastructure and landscape along MnDOT right of way for transportation planning and highway design. The aerial photography is mostly collected through consultants using airplanes, with the exception of a small amount of internal drone collection. Data is collected using a combination of photography and Light Detection and Ranging, which uses millions of data points from laser sensors to create accurate base map and elevation maps of the area. In order to obtain accurate aerial mapping, MnDOT crews paint large white “X” targets on paved surfaces, and place wood or fabric “X” targets on unpaved surfaces. A survey crew then records the coordinate position and elevation of the temporary targets for tying the aerial photography to the ground. These temporary targets are removed when the photography is completed. Aerial photography can’t be done during the winter. Springtime offers the optimal topographic conditions, Mehran said, adding that more than 80 percent of the photography work is done during this time. Many things have to go right for the data to be collected. The trees can’t have leaves, the snow has to be gone, there can’t be water on the ground and the sun has to be out (in order to cast shadows). The flight work is based on upcoming projects in consultations with districts around the state. Each district submits a list of needs, to create a comprehensive list of projects to be mapped. 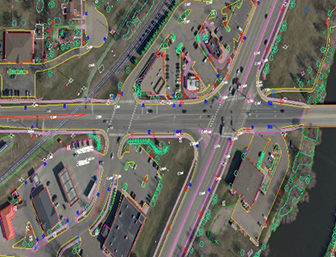 MnDOT partners with aerial contractors, and the data is used to create accurate engineering maps. Providing better places for people to bicycle requires close coordination between agencies, community members and advocacy organizations. The Office of Transit and Active Transportation recently completed district bicycle plans to help identify the best paths or roadways for future investment in bicycle facilities. The district plans will help implement the Statewide Bicycle System Plan, which was adopted in 2016 and set the stage for coordinated work to improve bicycling in Minnesota. In each district, MnDOT staff worked with partners from Regional Development Organizations, Metropolitan Planning Organizations, cities and counties. This coordination was critical, as district technical advisory committees worked to identify bicycle investment routes along and across trunk highways and local roads and trails. Bicycle investment routes do not indicate recommended routes for travel, but do identify collaboratively identified routes for future investment within state bicycle route network priority corridors. The Minnesota State Bicycle Map will continue to be the primary source for Minnesotans looking for information about bicycling routes. With limited funds available for investment in bicycle facilities, it was important to identify how MnDOT would prioritize future improvements. 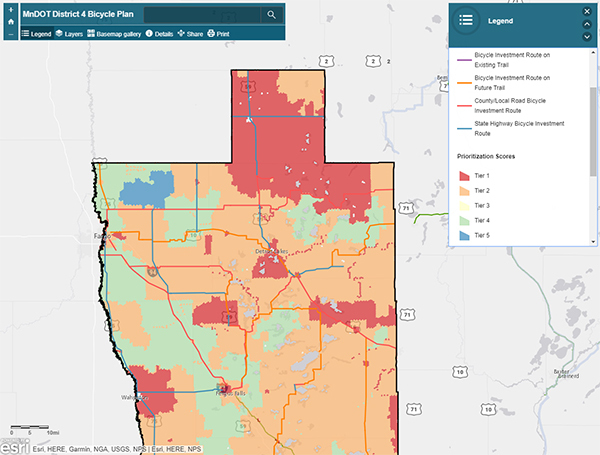 The plans used MnDOT’s Suitability of Pedestrian and Cyclist Environment tool, developed by the Office of Traffic Engineering, to highlight places in Minnesota where it might be expected that more people do bicycle or would want to bicycle. Prioritization scores are also available for transportation partners to use as they work to implement local projects. The district bicycle plans are already having an impact on MnDOT’s work. More information about the project and copies of each plan can be found on MnDOT’s District Bicycle Plan website. For more information, contact Jake Rueter. The district bicycle plan interactive maps allow users to more closely examine investment routes and prioritization scores in each district. 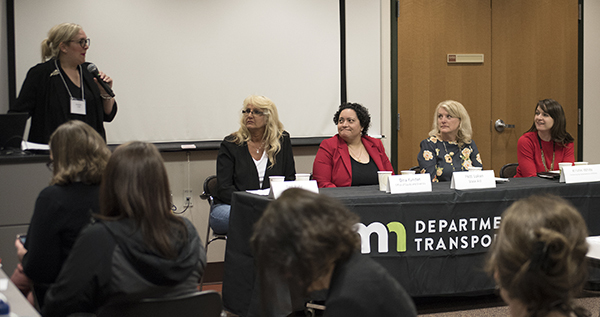 (Left) The panel discussion Elizabeth Arndt led, which included (from left) Teri Bahr, District 2, maintenance supervisor; Gina Kundan, Diversity and Inclusion training coordinator; Patti Loken, State Aid programs engineer; and Kristin White, CAV-X innovation director. 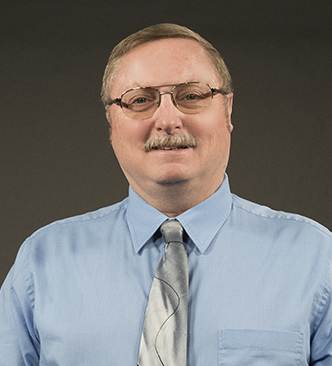 Joseph Palmersheim, Office of Communications, takes over the reins as the editor of Newsline, MnDOT’s employee newsletter, effective April 10. He succeeds Rich Kemp, who has moved to a photographer position after six years of editing the publication. Palmersheim joined MnDOT in August 2018 as a web content specialist. Prior to that, he spent four years in K-12 communications and nine years in newspapers. “I’d like to thank Rich Kemp for his years of service at the helm of this publication,” said Kevin Gutknecht, communications director. 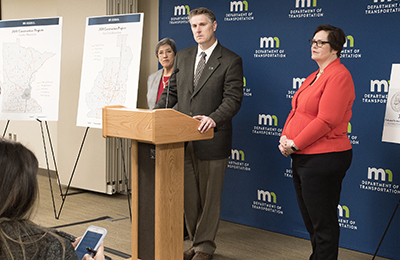 "Newsline has expanded under his leadership, and now includes such tools as video to help tell MnDOT's story." Palmersheim said Newsline plans for 2019 include a publication redesign. The newsletter will continue to be produced in its current format until that time. The Office of Communications is seeking stakeholder input as part of this redesign process, he added. Let us know what you'd like to see in Newsline. “We have a great story to tell here at MnDOT,” Palmersheim said. "I'm looking forward to working with our staff and stakeholders to share it." Story ideas from employees are always welcome. Please contact us with a story idea rather than submitting a completed article. Joseph Palmersheim can be reached at 651-366-4271 or at joseph.palmersheim@state.mn.us. Mike Barnes is the new Metro District engineer. In this role, he will provide leadership and strategic direction, while continuing to strengthen relationships both internally and externally. Barnes has worked for more than 30 years at MnDOT in a variety of technical and managerial positions. He spent a year with a consulting firm and served as the I-94 Corridor director. In recent years, Barnes was the assistant commissioner for both the Operations and Engineering Services divisions, and served on MnDOT’s Senior Management Team. "We have challenges but even more opportunities ahead of us with potential funding," Barnes said. "I’m excited and honored to be a part of Metro and the MnDOT team." Jody Martinson, assistant commissioner, Operations Division, described Barnes as "a strong advocate for equity and inclusion, resource planning, project management and collaboration efforts internally and externally. “He is a proven leader and we are excited for him to take on the leadership of the Metro District," Martinson said. 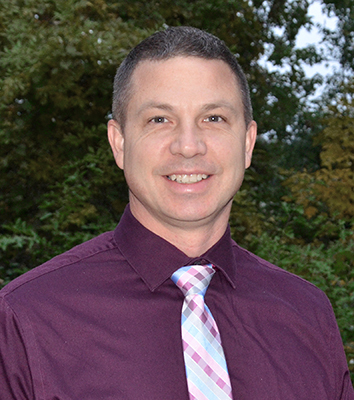 Jon Solberg, most recently the Office of Environmental Stewardship director, has returned to the Metro District as its new Planning, Program Management and Transit Director. 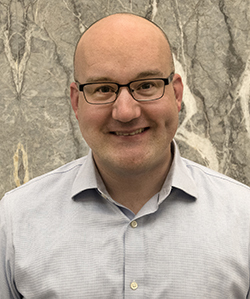 In his new role, Solberg will oversee the Metro District Construction Program/Budget, the Twin Cities Multi-Agency Planning functions, the MnPASS planning and policy program, and Transit Section planning, design, construction and operations. Having joined MnDOT in 2008, he has previously served as a senior planner, planning program coordinator and as South Area Manager.